Pull or push? Diatonal or microtonal? Traditional bear hunting celebration or reflections of the cosmos? Antti Paalanen and Veli Kujala prove that the accordion can do it all. Finland certainly produces very unique accordionists! Where else could an accordion player perform with invisible duet partners, as recently seen in Johanna Juhola’s concert Imaginary Friends? Or create an organ-accordion out of church organ sound samples, like Kimmo Pohjonen has done? 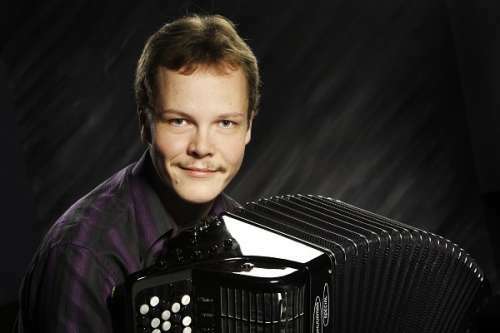 Antti Paalanen and Veli Kujala also have a place in this group of specialist accordionists. Paalanen, who has a folk music background, teases poetry out of his three-row accordion when he is not whipping his “devil’s lungs” into heavy metal action. Veli Kujala uses five-row and microtonal accordions to create tonal works the size of the cosmos, which are balanced by contrasting activities, such as merry jazz romps with the ensemble Gourmet. Paalanen’s doctoral degree, titled “Bursting bellows – Bisonoric accordion’s bellows rhythmics in composition”, focused on creating new music for bisonoric accordions and finding new ways for the instrument to evolve further. As a child, Paalanen learned traditional “pelimanni” music by ear at his local community college. He continued at the Sibelius Academy Folk Music Department where his studies culminated in an artistic doctorate. “Today, I work with sound designer Samuel Volanto to achieve a similar effect through experimenting with different sound techniques.” In addition, Paalanen has developed a new 3-row accordion, with an original keyboard layout and range, in order to achieve a stronger sound. ”Accordionists used to play the ‘hit’ songs of their time. Now I try to figure out how to use bisonoric accordions to perform music in a way that resonates across different eras. On the other hand, my involvement with performance art has inspired me to abandon any instrument-specific traditions. I play around with these concepts in my music, whether I’m playing traditional pelimanni music with Kiharakolmio, performing my own soloistic music, or playing a prepared accordion in a performance titled ‘Karhunpeijaiset’ (traditional bear hunting celebration), initiated by shaman violinist Tuomas Rounakari." Veli Kujala wanted to learn the piano, but his music school suggested another instrument instead: ”I ended up with the accordion by accident!” After graduating from the classical music performance program at the Sibelius Academy, Kujala continued his studies in the doctoral degree program, focusing on new Finnish music for the accordion and commissioning compositions for both solo accordion and ensemble. Microtonal accordion and works written specifically for the instrument gradually became a part of his degree. Kujala’s written thesis is an accordion instrumentation handbook for composers. Not interested in being exclusively a classical performer, Kujala is known as an active composer and a master of many different styles. ”Improvisation and jazz harmonies first began to intrigue me in high school, and they have followed me ever since. The fascinating thing about improvisation is the uniqueness of each moment. I do like learning written music as well, but improvising provides a more direct route into music, without having to worry about hitting the right notes. It is a good pathway to both contemporary music and Baroque,” he muses. Kujala tours Central Europe this August together with pianist Jarkko Riihimäki, violinist Benjamin Schmid and tuba player Andreas Hofmeir. “Our repertoire is ‘smack-bang in the middle’, with everything possible from virtuoso violin works to Arvo Pärt and Kurt Weill!” Kujala is also actively involved with other ensembles, including Pipoka, Kalle Kalima K-18 and his jazz combo Gourmet. Antti Paalanen’s poetic solo album Äärelä was a starting point for his doctoral degree. ”Music makers dig deep into themselves for inspiration, trying to portray their feelings and to reflect their own time. With no words to work with, accordionists have to reveal everything through playing”. Paalanen wanted to find a fresh angle on his meditative playing and ended up discovering his inner alter ego, an aggressive heavy metal head from his teenage years, whose music can be heard on his solo albums Breathbox and Meluta. The latter was nominated for both the Teosto Prize and Nordic Council Music Prize in 2016. Now Paalanen wants to play music that is cheerful and danceable. “The kind of music that makes you feel good! But being a gloomy Ostrobothnian male, the moments of unearthing that cheerfulness are few and far between, and it tends to be awfully hard work to produce any music out of it!”, he grins. His new album will be released next spring and its first single track “Child in You”, complete with a music video, were pre-released last May, in collaboration with vocalist Haaven and Tsuumi Dance Theatre. Kujala’s concerto for accordion and big band, titled Thum Bop, will be premiered in September 2017 by the UMO Jazz Orchestra. 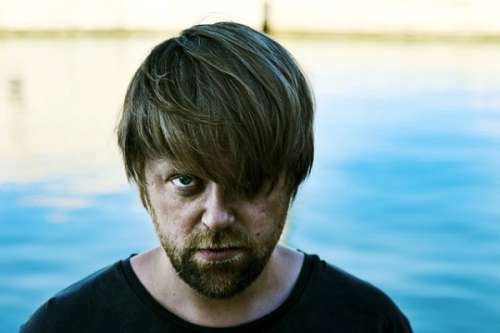 Last year, his album HyperOrganism was nominated for the Classical Emma Award as well as the Album of the Year by YLE (Finnish Broadcasting Company). The album featured his own compositions, Hyperchromatic Counterpoint for microtonal accordion and multitrack tape and CybOrgan for organ, orchestra and live electronics which were programmed by Kujala and operated by infrared sensors. “There is a lot of interesting experimenting going on around the accordion, both in Finland and abroad. I hope discovering new things and being innovative will always be part of the process,” Kujala says.